Children as young as 10 may fly. If younger children are confident to fly, they may participate. You can hike as long as you can through the mountains, but you’ll never get views like this from the ground. 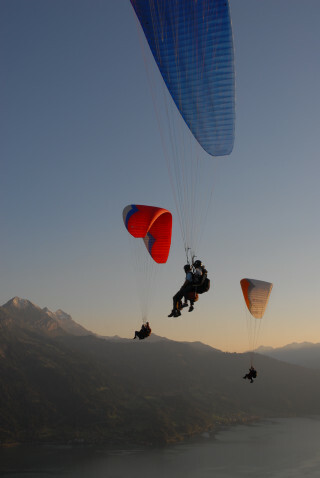 Admire Interlaken’s surrounding famous peaks and lakes as you paraglide through the fresh Swiss air. 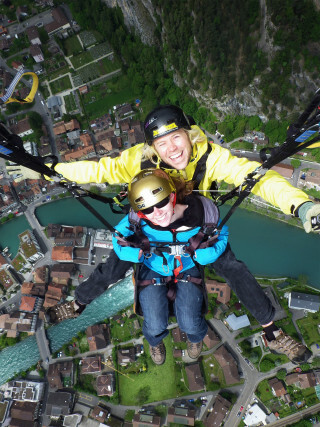 From your hotel or the Interlaken Ost or West train stations, a shuttle transports you to the flight school to get equipped for the adventure. Then, your fully trained and licensed pilot drives you to the launching point in Beatenberg, just outside Interlaken. 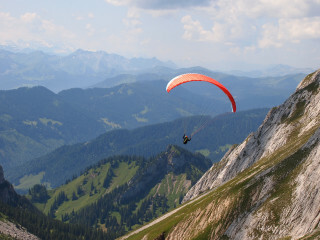 If it's your first flight, you learn about the fundamentals of paragliding and preparation basics for takeoff. One quick running start and you and your pilot are off into the air! With the breeze flowing by and the sun shining, flying through the air is almost unreal. Marvel at the famous cluster of mountains Eiger, Monch, and Jungfrau, each reaching high into the sky with rugged peaks at around 4,000 m (13,120 ft). 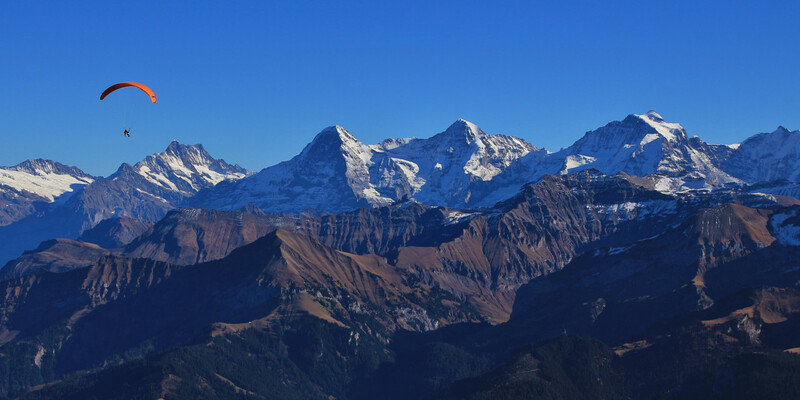 See also the remarkable Schilthorn 2,970 m (9,744 ft) and Titlis 3,238 m (10,620 ft) mountains, each their own distinctive mark in the Swiss landscape. The peak of the flight takes you as high as 1370m (4500 ft) into the sky. 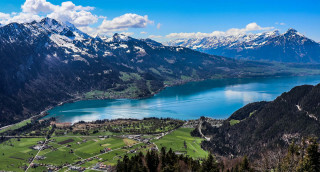 The flight takes you over the bright blue Lakes Thun and Breinz, the glacial bodies of water bordering Interlaken, and the turquoise waters of the Aare River. Depending on the weather, the flight may last between 12-30 minutes. No matter the length, its nothing short of spectacular. Find a birds-eye view of the famous mountains hosting climbers and hikers year round. 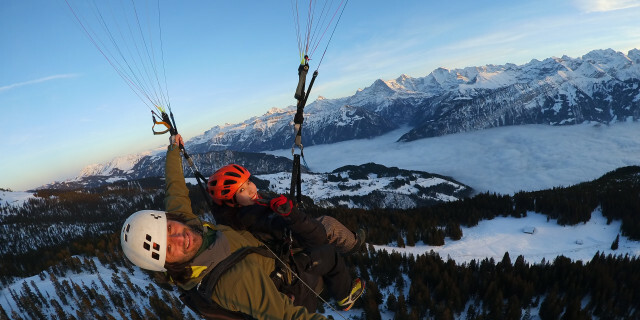 The sensation of paragliding through the snow-topped summits of the Swiss Alps will stay with you long after you touch the ground.